What happens when two former ministers go up against each other? 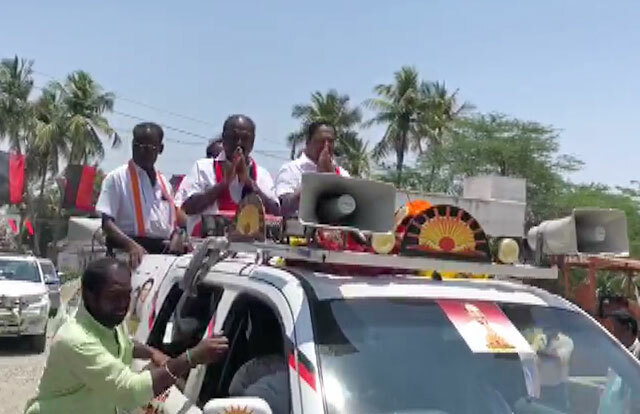 No sparks fly, reports A Ganesh Nadar from the Arakkonam Lok Sabha constituency in Tamil Nadu, but it is the summer heat that has the last word on the campaign. IMAGE: The DMK's S Jagathrakshakan (left) on the campaign trail. So weakened was he by the summer heat that he had another person alongside him to given speeches and urge people to vote for him. The Dravida Munnetra Kazhagam candidate from Arakkonam Lok Sabha constituency is a self-confessed billionaire. Former Union minister S Jagathrakshakan -- he was minister of state for commerce and industry in 2012-2013 in the Manmohan Singh ministry -- has disclosed family assets of Rs 114.7 crores in his election affidavit with zero liabilities. Last year he resigned as director of a Singapore-based company that went on to make the largest FDI in Sri Lanka; his wife still holds 45,00,000 shares in the said firm. Facing him is another former MoS, A K Moorthy of the Pattali Makkal Katchi. But when you encounter Jagathrakshakan during his election campaign in Ranipet, one of the assembly constituencies in the Lok Sabha constituency astride NH4 running from Chennai to Bengaluru, 80 km outside Chennai, there is none of the bandha (manner) associated with the super rich. Even his motorcade is modest in size. None of the youngsters sitting on bikes flying the DMK flag waiting for their candidate, I am sure, know of Jagathrakshakan's background. Before I quiz them, he has materialised in an open vehicle, saying 'Vanakkam' with folded hands here and a wave there when he made eye contact. He is very tall, and the black of his hair belies his 68 years. His vehicle is followed by a van with a live band which was making the maximum noise even while a song was playing. Several vehicles follow him, including one Election Commission observer. All this is accompanied by 50 motorcycles both in front and behind, weaving dangerously between the highway traffic. Luckily, he soon leaves the highway and enters a smaller road snaking its way between hills where rocks were being broken to feed the hungry construction industry. Earlier, the dust from these mills used to coat roads, and now it is being sold as M-sand to replace river sand which used to be mixed with cement for building homes. When the convoy stops at one place an old lady performs an aarti of the candidate. He stays in his vehicle, but bends down to place a note in the plate, as is the custom in Tamil Nadu, all this done strategically out of view of the EC observer vehicle. The candidate has employed a man to deliver his speeches while he just stands and waves to voters. "Among other things he has promised to change MGNREGA from 100 days to 200 days. He has also said that they must have suffered the last five years when he wasn't MP," the designated speaker drones on. Jagathrakshakan has twice been the MP from Arakkonam, in 1999 and 2009. Once he is on his way, the women folk look expectantly at the ward member who had asked them to wait. He pulls out a wad of 50 rupee notes and starts distributing it. "I will come again before the elections," he assures the women. After the convoy halts between villages, the DMK candidate gets down, saying he is very tired. The heat has clearly got to him. He gets into his own car promising to get down at every point where people are waiting. In Ranipet town there is no sign of any election. 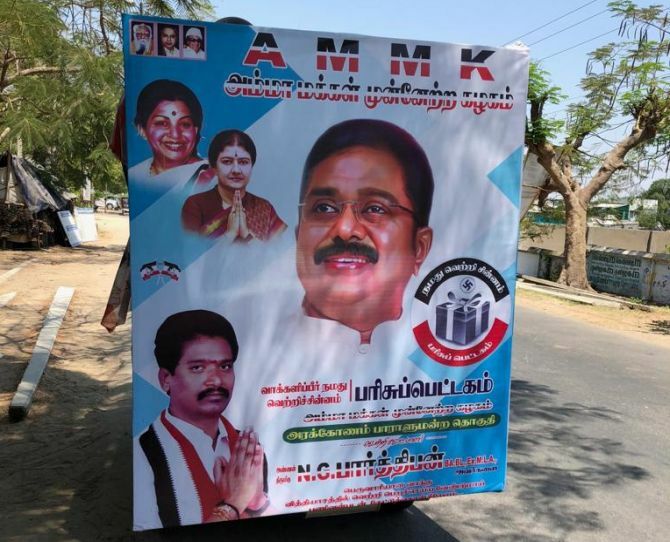 A lone autorickshaw (below) plays songs and in between a man keeps urging the people to vote for the "gift box", the symbol allotted to All India Anna Dravida Munentra Kazhagam rebel leader T T V Dinakaran's Amma Makkal Munnetra Kazhagam. 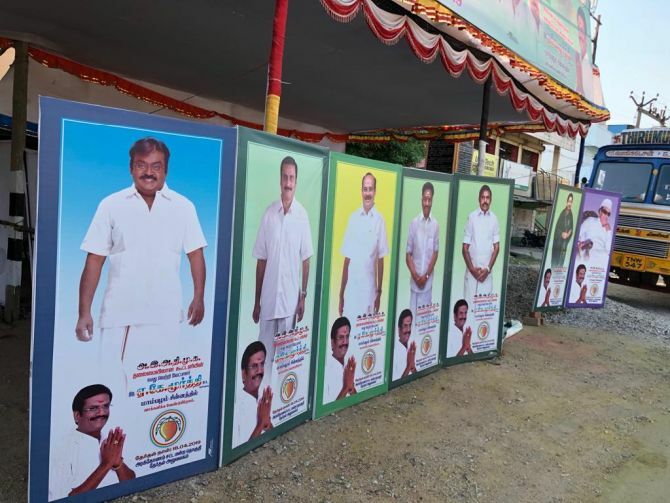 In the Sholingur assembly segment, the Pattali Makkal Katchi, which is in league with the ruling AIADMK and has been allotted the Arakkonam seat, is just getting its campaign going. Several young men and two cars wait by the side of the road, and soon another man comes along with a group of women he had gathered to welcome the candidate, A K Moorthy. Like Jagathrakshagan, Moorthy is also a former minister of state in Atal Bihari Vajpayee's government. In the Thiruttani assembly segment, one of the six abodes of Lord Murugan, the Tamil deity and younger brother of Lord Ganesha, the local tea-seller is a compendium of political knowledge. "The DMK is going to win very easily and they have Dinakaran to thank, he will split the AIADMK vote, and anyway all their votes will not go to the PMK," the chaiwallah declares wisely.